If you appreciate vineyards, olive groves, turquoise seas lapping against quiet, sandy coves and picturesque towns and villages then Korčula is possibly your dream destination. You’ll also find the traditional culture is vibrant and strong here, from the music and dance, to the old religious ceremonies, to the production of the food and excellent wine. Some of the best places to stay on Korčula can be found in Korčula Town, an historic citadel right on the water with a wonderful old town rich with Gothic and Renaissance architecture, fantastic defensive towers and red-roofed houses, a bit like a mini-Dubrovnik. You’re just an easy walk from some beautiful, sandy beaches, and the town has some wonderful churches and museums. As well as the cultural and culinary treasures of Korčula Town, and the beautiful waters and coastline of the Dalmatian Coast, Korčula is very popular with cyclists. And if you’re here with your bike then some of the best places to stay on Korčula will be out in amongst some of that rural idyll the island promises. There are numerous pretty villages both on the coast and back from it, and many of them are worth popping in to, with charming bars and cafes, nice architecture and beautiful views. You might also want to bring your snorkel or rent a kayak and see the island from the sea. Don't forget that this pretty island is incredibly busy during the peak summer months. So if you're planning to visit during July or August and want to book one of the best places to stay on Korčula, you'll need to get organised and plan well ahead. 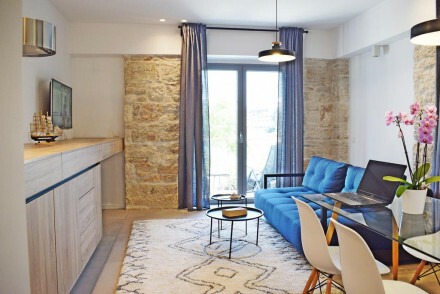 The Lesic Dimitri Palace is a gorgeous collection of boutique apartments right on the Bay of Korčula. As well as having beautiful creamy decor and all the mod. cons., the Palace has a lovely Mediterranean style spa and offers wine tastings. Apartments sleep between two and nine. Tara’s Lodge is a modern, stylish hotel with 17 sleek, minimalist rooms, whitewashed walls and private balconies facing out onto a secluded, turquoise bay. Rooms start from around £130 per night. Split airport is the nearest airport to Korčula and is well connected to the UK and the rest of Europe - especially during the busy season. From Split catch the ferry catamaran via Hvar, which takes a couple of hours. If you can’t find a suitable connection from your local airport try flying in to Dubrovnik airport, from where there’s a single bus a day, or you can catch a ferry. Of course you can also arrange airport transfers. If you want to hire a car - which we highly recommend if you’re staying in Korčula and you want to see more of the Dalmatian Coast but you don’t have a sail boat - we recommend you visit our online partner,Rentalcars. Still not sure which is the best place to stay in Korčula for you? or consider nearby Brac or Split? A charming hotel set in the heart of the 1000-year-old city of Korcula. Having undergone a thorough renovation the old building has taken on a new chic contemporary style. 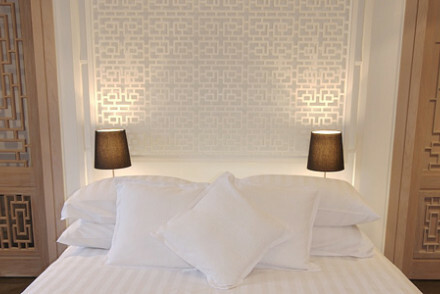 The light, bright rooms all boast sea views and a superb terrace restaurant serves Dalmatian specialities. Active Holiday - With various beaches within walking distance, snorkeling, canoeing, windsurfing or diving can easily be arranged! 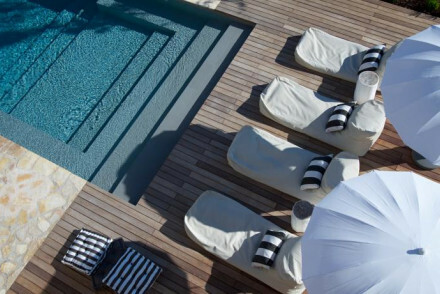 A modern stylish hotel situated on a stunning secluded bay on Korcula. Sleek minimalist rooms with white washed walls and bay facing balconies. By day explore the areas beautiful coastline and in the evening relax in the bar and admire the stunning views. A grown up and indulgent getaway. Beach Life - A beautiful beachside hotel, in the charming village of Zrnovska Banja with suites and terraces overlooking the turquoise bay. Local exploring - A perfect launchpad for exploring the fascinating island of Korcula, either by land or by sea. Fishing - Sea fishing trips can be organised by the hotel, a great way to spend an afternoon. Sights nearby - History buffs must visit St. Blaise's Fortress just a mile from the hotel. Gorgeous collection of boutique apartments in the Bay of Korcula. Creamy, chic suites with all the mod-cons. Variety of watersports in the beautiful bay, Mediterranean spa and wine-tasting in the hotel. Ideal for families or romantic breaks in the sun.